Our Butterfly Preschool Montessori room is well-equipped for the foundation of our children ages 3-6. We have based our Butterfly Preschool classroom upon the six principles of Montessori along with a three-hour interrupted work cycle. With this is mind we had created a foundation for optimal, independent early childhood learning and exploration. Our daily “plan-do-review” sequence ensures that the children in our care master learning concepts in a developmentally appropriate way while building communication and active listening skills. We have adopted a curriculum model that follows Montessori’s hands-on, exploratory approach to learning. Lessons are individualized to meet and target each child’s unique developmental needs. 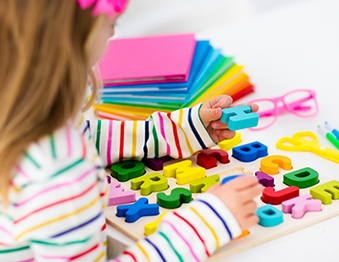 Our Montessori curriculum provides activities that connect what children already know to new learning experiences and encourage them to extend their learning through problem-solving strategies and creative thinking. Our Butterfly classroom encourages children to explore through the various materials and works available to them. Our children explore the areas of math, science, sensorial, geography/culture, language, and practical life. Along with these areas, we also learn about respect as well as grace and courtesy through our interactions in our environment. Our Butterfly classroom is designed to facilitate maximum independent learning and exploration by the child. Our children are free to choose work and work at their own pace under the guidance of our AMS trained directress. Our peaceful classroom offers learning opportunities in practical life skills, sensory learning, language acquisition, math, geography, zoology, botany, and respect. These important areas enhance our children academically and developmentally. Our students are also provided with opportunities for after school workshops once weekly to encourage healthy habits, breathing exercises, increased focus, and self-acceptance. Parents enroll in workshops selected by the collective of all parents. Please note that enrollment in Liberty Montessori Butterfly Primary program requires a full academic school year commitment. Our school year runs from September to June.